In May, Shock Totem Publications will be releasing its first non-magazine related product. 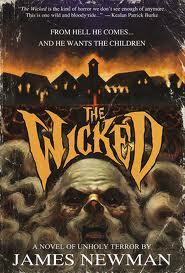 The company is re-releasing a book, The Wicked by James Newman. An ode to 1980s horror, The Wicked is Newman’s second book, which was originally published in 2007 in limited edition hardcover. The new version features revised text, a new foreword by Mark Allan Gunnells, a new afterword by Newman, and brilliant new artwork and illustrations by Jesse David Young (with additional cover layout by Yannick Bouchard). Also included is a brand new, exclusive tie-in short story the author wrote specifically for this release. The Wicked will be released in paperback and e-book formats. Newman is the author of the critically-acclaimed Midnight Rain and Animosity, the short-story collection People Are Strange, and the novellas The Forum, Revenge Flick! and Olden. There’s a misconception around the campfire these days that certain products should only be placed in a venue that showcases primarily the same exact products, just in different packaging. The same can be said about writers. We all want to present our work in environments where we are most likely to reach a captive audience. It only makes sense to want to sell our books at events where people attend simply to buy books. Trendy restaurants join other restaurants at local food festivals to sell their food and hot tub salesmen compete with other hot tub salesmen at the local hot tub expos, so why not? For starters, we aren’t hot tub salesmen; we’re authors with our own unique approach in our artistry. There is something very different in all of us that sets us apart from the assembly line produced…dare I say, crap. Over the years, I have worked at various trade shows with my company and the most important thing I’ve learned is the value of having a unique and distinguished product to offer. Fortunately, my company fits that description, however I’ve witnessed much frustration and disappointment among patrons due to the over abundance of repetitive trade displays such as window installation, granite countertops and vinyl siding companies. So when I began the process of selecting events to promote my new book, I was aiming toward venues where I wouldn’t be just another author pushing my wares. I wanted to find places where an independent bookseller would be a welcomed surprise rather than a usual suspect. Thanks to the like-minded folks at the NEHW who organize networking events, my vision has been met head-on. Sure, the horror cons such as Horror Hound Weekend and Rock & Shock are festive and fun. Yes, the energy at a comic con is off the hook, but when it comes to actual book selling and valuable interaction between writer and reader, arts and craft shows are an untapped resource for authors. When I spoke to a fellow writer not too long ago, they laughed and asked me if I hated the thought of being in a setting where soccer moms are buying handmade jams, baskets and socks. To which I replied, absolutely not. I would much rather interact with soccer moms than try to convince some teenager, who only has enough money in their pocket to meet Kane Hodder or Tony Todd at their 18th million appearance, that he/she should be buying my book instead. In short, I’d much rather spend my time at events where the chances are much greater that I’ll sell books and make fans. 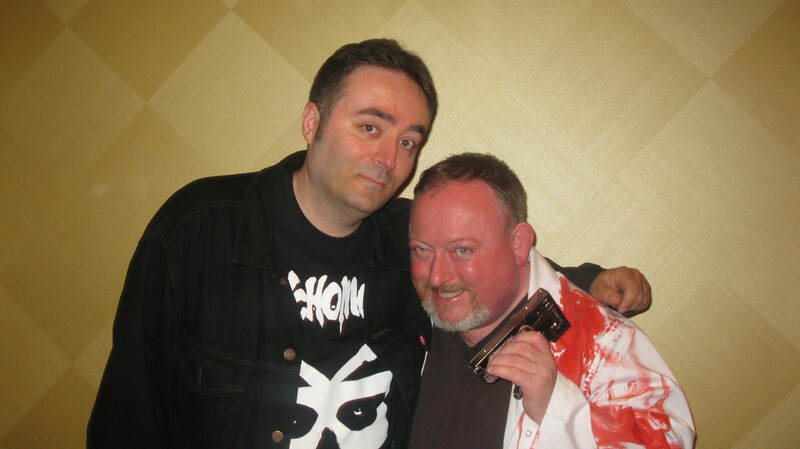 Even though I write horror, a horror con isn’t always an ideal venue for a bookseller. The same can be said for comic cons. Attendees at these types of events are not really interested in books. They just aren’t. It’s not a slam on them; it’s just the way it is. They are more interested in meeting celebrities, sorting though rare DVDs and dressing up as their favorite characters. That’s not to say that I don’t enjoy these events because I do and oftentimes it’s more about who you meet rather than book sales. Just two weeks ago, I had a table at the Toronto Comic Con. Book sales were ok, but the best part was meeting an illustrator who’s going to design for me. So in the end, it was worth the time, travel and cost. It’s definitely worth it to participate in as many events as possible. But they aren’t all at the top of my preference list. Whenever I see arts and crafts events listed on the NEHW’s calendar, I jump at the chance to attend every one of them. I love that we’re known simply as the authors in the room, not the other authors, or the one out of 20 bookseller tables. We are distinguished and well-regarded might I add. And the best part is, the patrons at these events actually enjoy reading and they love the fact that they are buying the books directly from the person who wrote it. And make no mistake about it, we as writers and independent booksellers fall under the guise of arts and crafts. These events are held everywhere, at any given time of the year and at low-cost. Why not take advantage of it? Don’t just wait for horror events held in the fall. October horror writers are only what Santa Clause is to Christmas. But that doesn’t need to be the case. And if I have the choice between selling at a horror event, where I’m up against Jack Ketchum’s forty-dollar signed copy of Off Season and Robert Englund’s autograph, I’ll take selling next to a table of country-made jam any day of the week. Here are links to previous stories that contain important advice for authors. Practical PR in Five Steps or Fewer. Jeers of a Clown: Exploring the Balancing Act of Black Humor Writing. The Journey to an Author’s First Autograph. An Author’s Account of the Middletown Open Air Market. Breaking Out of the Vacuum. I had no intention to attend Boston Comic Con this year. My son’s girlfriend, Amy, had brought it up a few weeks ago, but no plans were made to go. On Friday night, however, she was over visiting and brought it up again. My son, Devon, had no desire to go either, so she was doing her best to convince him. Now, I haven’t been to a comic con in many years, but the prospect of going piqued my interest. I pulled up the website and checked out the details. There was going to be 74 featured guest artists there. 74! Wow, these things have gotten much bigger since the last time I went. I use to collect comics. I stopped pretty much cold turkey back in the nineties, when all those endless crossovers became big. They drove me nuts, interrupting the ongoing story lines of your favorite series and also forcing you to buy books you didn’t want, just to keep up. It was a sales gimmick that I quickly grew to despise and drove me away from comics completely. I’m still a fan, of sorts. I see every comic book based movie that hits the screen and I’ve been pretty happy with Hollywood’s attempts to bring some of my old favorites to life. I still have probably thirty boxes of comics in storage. It’s like the fan in me is in hibernation, I guess, like my collection. So when I looked over that list of 74 artists, I didn’t recognize quite a few of them. I’m guessing there are many who have entered the business since my comic collecting days. But still, there were a few that really caught my eye, like Bernie Wrightson, for instance. Wrightson is an artist I have admired since I started reading and collecting comic books. You see, what first drew me into comics were horror comics. I was reading them for a couple years before I even noticed the super hero books. Maybe it was growing up watching Creature Feature on Channel 56, but I’ve always had this fascination with monsters. Wrightson was of course, an illustrator on many of the horror comics that I grew up loving. These had titles like, House of Mystery, House of Secrets, Tales of the Unexpected, and Vampirella. Did I mention he was the co-creator of Swamp Thing? Yeah, that too. Wrightson didn’t stop with comic books, though. He did an illustrated version of Frankenstein, which is absolutely beautiful. Later in his career, he went on to do some illustration for my favorite author, Stephen King. Mr. Wrightson illustrated The Cycle of the Werewolf, The Stand, and even did some work on the Dark Tower series. Needless to say, I was excited at the chance to meet him. Also on the list of artists, I noticed the name Bill Sienkiewicz. Wow! There was another guy who had impressed the hell out of me with his art. You see, Sienkiewicz brought a style unlike any other I had ever seen when he entered the comic book industry. In 1984, Sienkiewicz took over as the artist for the X-Men spinoff, New Mutants and brought an expressionistic style that was mind-blowing. I’m not sure it was for everyone, but I know he gained quite a bit of recognition and managed to work with some of comicbook greats at that time like Frank Miller and Alan Moore. There were a couple other names that stood out to me like Bob Layton of Iron Man, Kevin Eastman of the Teenage Mutant Ninja Turtles, and Simon Bisley whose work I remember from Judge Dredd and Lobo. It was enough for me to want to go. To top it all off, my twelve-year-old daughter, who to my knowledge has never read a comic book, begged to go. Between my son’s girlfriend and my daughter, they managed to convince Devon to give it a try. I was happy to drive, so the plans were made. My daughter invited her cousin, Roberta, so she would have someone the same age to tag along with her. Saturday morning, I picked up Amy and brought her back to the house. She was carrying this trash bag full of costumes because apparently the three girls were determined to dress up. They had the idea that people went in costume to these cons and they wanted to participate. I certainly wasn’t going to put a costume on, but I didn’t mind if they did. There wasn’t a lot of planning involved here, so my daughter Kay ended up as Alice in Wonderland, Roberta was a sort of Victorian age vampire, and Amy wore a Pink Floyd shirt and flag as a cape. With the girls dressed up and ready to go, we headed off to the Hynes Convention Center in Boston. The first problem encountered is that the Hynes is near Fenway Park, and the Yankees were playing the Red Sox that day. Finding parking was an adventure. As we passed the Convention center looking for a parking garage, we saw this ridiculously long line outside of the building. That couldn’t be the line to get in, we said. Spotting several people in line dressed as comic book characters confirmed our worst fears, though. The line moved quickly, however, and we probably only waited thirty to forty minutes to get in the building. None of us were prepared for what we found inside. It was wall to wall with people. You really couldn’t get anywhere without fighting your way through the zombie-like horde of comic book fans. At first, this really bothered my daughter. She complained to me quite a bit. I reminded her that she begged me to bring them. After a while, we all just got used to it. Devon and his girlfriend went right over to the Newbury Comics table to check out The Walking Dead books. My family is a fan of the show, but none of us have read the books. He grabbed the first few, which was okay with me, since I wanted to read them, too. Amy grabbed a few things that she was really excited about, including a Doctor Who book as a thank you present to me. We stopped at an artist who did a portrait of my daughter and niece in anime style. This put them both in happier moods. When we hit the back row, I saw the line for Bernie Wrightson. I stepped up and he asked if I had anything to sign. I knew I had forgotten something. Oh well, he had some prints from his work on Frankenstein, so I bought one of those. More importantly, I got a picture with him. 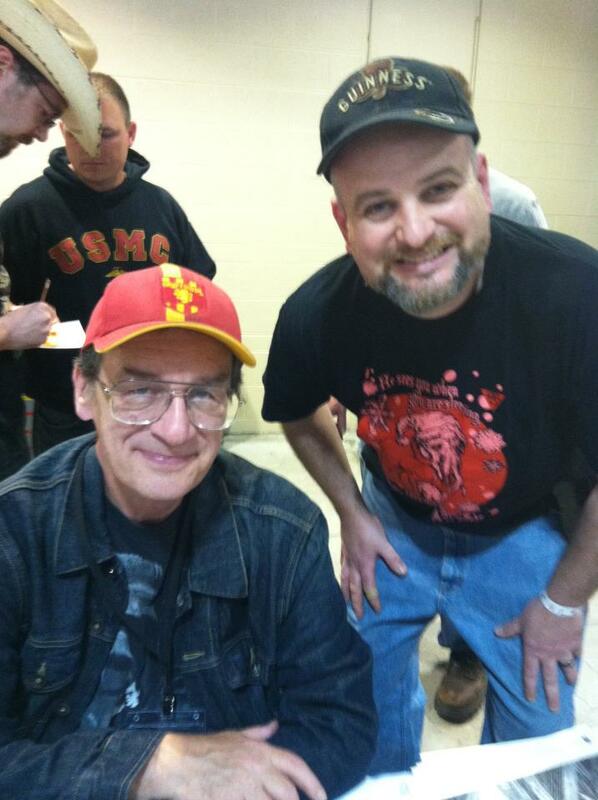 Bernie Wrightson and David Price at Boston Comic Con. We fought our way through the mob and did our best to take in the whole thing. I had just about given up on finding Bill Sienkiewicz when we finally stumbled upon him. I got another cool picture and my daughter got an autographed Cat Woman print. We tried to find another vendor called Madknits, who had these handmade stuffed little monsters, on the way out, but after bumping our way up and down a bunch of aisles, we gave up and decided to call it a day. The kids were hot, tired, and feeling a bit claustrophobic. All in all, Boston Comic Con was very cool, but it definitely needs to find a bigger venue. The Boston Convention and Exhibition center on the waterfront is much bigger and more suited to something that attracts as many people as comic con does. They should probably consider upgrading, even though I heard that this was an upgrade from previous years. We all had fun, which was the most important thing. Well done, Boston Comic Con. This entry originally appeared on Alex Laybourne’s website. As writers, we seek the approval of others for what we do. We may say that we write for fun, or because we love it, and that is all true. A writer writes because they have to, but we publish because we want to share our work, and in doing so we hope for good great reviews and the respect of our peers. If you talk to any successful person, they will invariably say that they have a wonderful family who supported them the entire way. Just watch any Oscar speech and you will see what I mean. This is also true, and say what you like about successful businessmen or actors. I cannot see another profession that takes quite the toll on friends and family as that of a writer. We live in worlds inside our head, worlds that not even our nearest and dearest – unless they happen to be writers themselves – could ever understand. We are moody and brooding when writing because we want to write more or need to work out a particular kink in the mechanics or arc of the story, or we are grumpy and moody because we are not writing at that moment in time. We write down and take a sometimes perverse interest in the crazy things that happen around us because it could be a good story idea at some point down the line. Yet our loved ones stick by us. They support us every step of the way. I have a friend who is really into these self-help books… or as I like to call them – common freaking sense. However, one point that comes across again and again is to surround yourself with people who love and support you. It is supposedly some big secret to success (sorry the RANT will stop and I’ll get back on topic now). Can you still count that as support? Are they a positive influence in your life? They support your writing, but when it comes to promotions, and you want to invest some money or a chunk of time during the day to promoting, they put their foot down and refuse. Where does that leave you? I am lucky enough to have the important people in my life supporting me, but there are a few that I know merely tolerate my dalliances with the written word, and view my attempts to carve a name for myself as nothing more than folly. They are waiting for me to grow up, to start pushing myself hard in other avenues… whatever they may be… please, send all answers to me on a postcard, because I draw a blank here. This post is dedicated to these people. The silent partners who suffer us writers and support our every step, without ever truly understand what it is we do, and why. It is also a swipe at those who merely tolerate our actions. You all know who you are, and fellow writers, you probably know who they are too. You may not understand why we do it, and you don’t have to. You should support us unconditionally. We are not asking you to do it for us, nor are we demanding you buy 500 copies of our book to make us feel good and give us a rankings boost. We are merely asking that you believe in us. Smile and nod when we talk about our work, even if it is just like the approach taken by John Wemmick with the Aged P in Great Expectations. We are the ones putting ourselves out there, you have absolutely nothing to lose. Finally, the time had come! The weekend where comic geeks all across Massachusetts could gather together and not hold their heads down in shame for enjoying sci-fi, fantasy and adventure. Myself included. This was a major event. Over the years, this con had gone from being held in small hotel function rooms, to small-scale expo centers, and finally inside the widely popular Hynes Convention Center located in the heart of Boston’s Back Bay. Judging by the attendance, an even larger facility may be necessary in the future. Literally, thousands of people flowed in and out of the hall throughout the day, many dressed as their favorite film and comic characters. It’s always cool to see parents bringing their young children to events such as this. It’s a wonderful bonding experience when the older generation can expose their kids to pop culture from their youth, as well as the parents learning about the newer culture through their kids. I actually witnessed a young child asking his dad who the two guys in makeup were (2 guys dressed up as KISS), and as he explained who they were, the kid begged to have his picture taken with them because they looked “so cool!” They actually did so I had to follow suit. 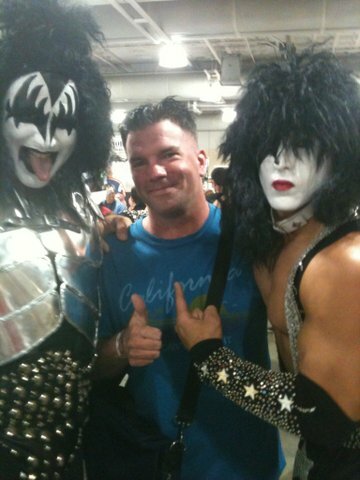 Rob Watts with two convention-goers dressed as KISS musicians. Oddly enough, there were no celebrity appearances at this event, as large of an event as it was. With the exception of high-profile illustrators, there were no “celebrity” signings to speak of. Last week’s Toronto Comic Con, in which I was in attendance, had many celebrity appearances, such as Scott Bakula, Jeri Ryan and Jeremy Bulloch. This isn’t an important selling point for me, I’m just curious as to why celebs (and the con) wouldn’t take advantage of such a largely attended event. I did have the pleasure of talking to some of my favorite illustrators such as Anne Cain, Ming Doyle and Ken Kelly, who designed a few KISS album covers and he was kind enough to give me a sneak peek of what may turn out to be KISS’ next album cover. 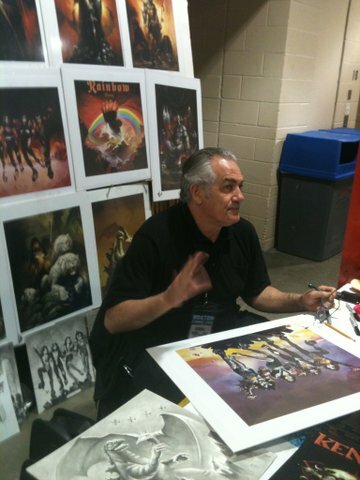 Artist Ken Kelly. Photo by Rob Watts. 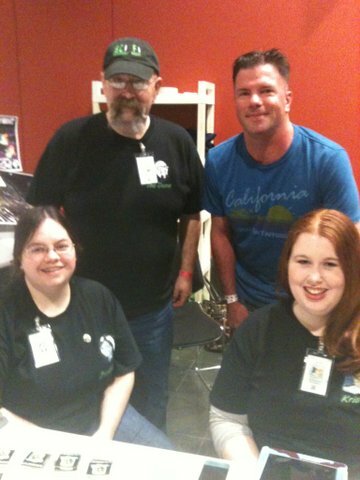 Of course, the coolest booth of the day was the good folks over at Sci-Fi Saturday Night. They had an ideal spot by the entrance and had a lot of visitors stopping by to chat with the cast. Dome, Kriana, Illustrator X, The Zombrarian and crew were cool enough to include me in their promo package, highlighting my book, CD and theme song I created for their show. Thanks guys. All in all, a fun day with amazing energy. If I don’t get to the Comic Con in San Diego this year, this one will certainly hold me over for a while. From left to right: Zombrarian, Dome, Rob Watts and Kriana. Editor’s Note: I want to thank Rob for writing this entry for the NEHW website and for his Live Journal page. Check out his page here for other entries. I took my 16-year-old son, Devon, to his first concert last year. Personally, I’ve been to hundreds, so I wanted to introduce him to something that has meant so much to me for most of my life. My favorite band since the late nineties has been Tool. Back when we were still going on all the Cub and Boy Scout camping trips, a Tool CD would always be playing on the car stereo. It obviously rubbed off on him since he has turned into a loyal Tool fan as well. I wanted to make Tool his first concert, but there was one problem. Tool only releases new albums once every five years or so. This has led to speculation that there won’t be a new Tool album. Another issue is, since the last Tool album came out in 2006, Maynard James Keenan, their singer and frontman has become involved in several other projects, including two bands and, more recently, starting his own vineyard. Arguably, he probably doesn’t even need Tool anymore, although I am sure that is where his greatest success lies. Last year, one of Maynard’s other projects, A Perfect Circle, came to the Boston area. Not knowing if my son would get the chance to ever see Tool, I purchased tickets and took Devon to his first concert at The Bank of America Pavilion, a great place to see a show. I never hesitate to get tickets for someone I wish to see if they are playing there. We had a great time that night. We sat at “reserved” small tables that seat four. A married couple sat with us, and they were very nice to Devon and excited he was getting a chance to see his first concert. The husband even tried to convince my son that he was going to be a bigger fan of A Perfect Circle than of Tool by the time the show was over. Devon knew nothing about A Perfect Circle before we went to the show, other than Maynard sang for them. He had never heard any of their music. By the time the show was over, though, he was a big fan, although the guy we sat with was reaching a little. He still loves Tool the most. Along came December and I received an email alert from Live Nation that Tool tickets were going on sale that Saturday. This was a huge surprise to me. I had heard nothing about an upcoming tour, so I had to read the email several times then had to go to the Tool website before I believed it. I had thought maybe it was just a Tool cover band. It turned out that it was true, so I sat by the computer when tickets went on sale. This is a maddening experience. You search for tickets at the moment they go on sale. You get to choose how many and at what price range, then you have to type out some nonsense words to prove that you are a real person. Usually you are told there are no tickets available and have to refresh your web page several times before you finally get some. I was lucky enough to not have to suffer very long, and after just a couple refreshes, I nabbed three tickets for myself, my brother, and my son. Having seen Tool a half a dozen times myself already, I knew this was going to be a completely different experience than A Perfect Circle. I had to prepare Devon for a Tool concert. I told him that, if it was anything like the previous ones I had attended; it would be very different from his first concert experience. Now, A Perfect Circle sounded great live, but there was no real stage show to speak of. They just stood up there and played. At the other Tool shows I have seen, they had a lot going on. There have always been intense light shows, and weird videos playing along with their songs. One year they even had two people in skintight body suits hanging suspended over the stage and doing some kind of bizarre air ballet. Devon needed to be ready for the strange and unusual at Tool’s show. Maynard and his pals did not disappoint me. We had a straight on view of the stage where we were seated. It was perfect for viewing one of the most elaborate laser and light shows I have seen in a long time. There were large video screens behind the stage that showed images of angels, giant eyes, swirling spirals, grasping hands and many other religious, magical and profane symbols. At times, it was just like looking into a giant kaleidoscope. The dazzling lights, brilliant lasers and disturbing images induced a kind of hypnotic feeling. The only other band I can think of that achieves a similar live effect is Pink Floyd, the most psychedelic act I have ever seen. The problem with seeing Tool is that you are never going to see them play all of your favorites on any given night. The average length of one of their songs is probably seven minutes, with several pushing ten or eleven minutes. That being said, they still did a great job of playing many of their favorites like “Stinkfist,” “Aenema,” “Schism,” and “Lateralus,” as well as mixing in a couple deeper tracks, like “Pushit.” In a weird way, I find Tool’s music meditative. It’s easy to get lost in it, and I am sure many Tool fans would agree. You can’t please all of the people all of the time, though. My son would have liked to have heard one of his favorite songs, “Right in Two.” I missed “Rosetta Stoned” and I know my brother wanted to hear “Eulogy.” That’s the beauty of Tool, though. The last album, I saw them on three different legs of the tour. Each time they had a different setlist, so if you wanted to hear everything, you just had to go a few times. As far as I’m concerned, it was well worth it. I have never left a Tool show disappointed, except for the fact that it was over too soon. There is supposedly going to be a new album. If that is true, then I believe this was sort of a getting to know each other again sort of mini tour for the band members. Gloriously, a new album will follow and I assume a much larger supporting tour. Wonder how many more times we will see Tool in the near future? As many as possible.